Gently rub callused areas to remove hardened skin. 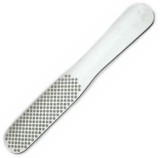 When the rasp screen becomes filled with dry tissue, simply tap the reducer tool on a dry towel. After use, apply your foot lotion such as Imperial Corns and Callus Solution.